Aside from a scoreless first period in the Canada-Norway game, there were no major surprises in the first day of Olympic hockey yesterday. That's a good thing for U.S. fans, who watched the Americans skate to a 3-1 victory over Switzerland in the tournament's opener in front of 16,706 strong. The City of Pittsburgh's only Olympian, Ryan Malone, scored one of the goals, with the balance of the offense coming from Bobby Ryan of the Ducks and David Backes of the Blues. It was a good, physical performance for a young U.S. team that has an average age of just over 26, featuring only three previous Olympians. While this game looked on paper to be America's to lose, the potential for disappointment was certainly there. Don't forget that in the 2006 Olympics, Switzerland beat both Canada and the Czech Republic, and the U.S. opened with a loss to Latvia. So this was definitely a best-case scenario for American hockey fans, who got the extra boost of having 1980 hero Mike Eruzione in the crowd yesterday. After a day off, the U.S. will be back at it on Thursday, with a 3 PM matchup against Norway. And that's a team that may have some self-esteem problems after a humbling 8-0 loss to Canada last night. Following the aforementioned scoreless first period, Canada turned up the heat in the second period, scoring three goals and limiting the Norwegians to just six shots. The third period would get even worse for Norway, as Canada struck five times, and Roberto Luongo continued to stop every one of the shots he faced. It was a hockey celebration for an entire nation, and the atmosphere was undeniably electric. While Marc-Andre Fleury was the only Canadian player not to dress, Sidney Crosby represented the Penguins and his country well, setting up three goals. Jarome Iginla lit the lamp three times for Canada, playing on a scary-good line with Crosby and Rick Nash. Dany Heatley netted two goals for the Canadians, who also got goals from Mike Richards, Ryan Getzlaf, and Corey Perry. Canada will be back in action on Thursday night at 7:30 against Sweden. Last night's nightcap also had a degree of local interest, as Evgeni Malkin and Sergei Gonchar helped Russia to a dominating 8-2 win over Latvia. Geno scored the lone goal of the second period, and assisted on a later goal from Ilya Kovalchuk. Gonchar was held scoreless on two shots. Alex Ovechkin rose to the occasion, netting two goals, as did Danis Zaripov of the KHL's Ak Bars Kazan. 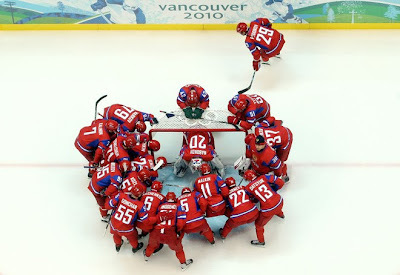 The Russians will next face Slovakia at midnight on Thursday night. Sorry, I didn't get to see any hockey. I guess primetime is only for curling and men's (if you want to call them that) figure skating. Actually, I found Antiques Roadshow to be far more compelling. The term "Men's" figure skating is only applicable when Chazz Michael Michaels is headlining the competition.